EASTERN RED CEDAR - Similar in appearance to Rocky Mountain Juniper but has a reddish winter color. 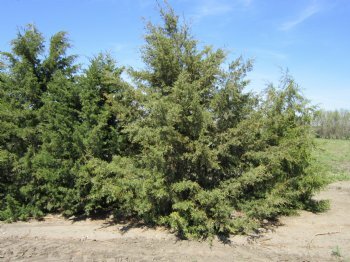 Very hardy tree considered by many to be the most important conifer for wildlife plantings in the Northern Plains. This specie should be selected over Rocky Mt. Juniper for planting in eastern North and South Dakota and MN because of its faster growth rate. Will reach 25 feet in height at maturity."